Home » endangered » environment » Galapagos Island » Jozsef Vagvolgyi » Lonesome George » Pinta Island » Tortoise » World Environment News » Slow and Steady wins the Race indeed, but will George win? Slow and Steady wins the Race indeed, but will George win? There are many creatures and animals out there, of whom we have not heard that often but their existence has made a difference to us, whether the animal is rare, extinct or endangered, it has a right to be known. The Pinta Island Tortoise is one of them. Pinta Island is located in the Galapagos Islands in Ecuador. There is just one tortoise there, called ‘Lonesome George’, which is the last known individual of the Pinta Island Tortoise family that is held safely at a research station on the island. The Pinta species is one of the extant subspecies that are natives of the Galapagos Island. George has been named the rarest creature in the world and was first spotted by malacologist, (people who study mollusks) Jozsef Vagvolgyi on 1st December 1971. The creature is 100 years old and has not produced an off-spring even upon mating. There was a study carried out in the year 2007 that suggested that there are other mixed creatures belonging to the Pinta Island tortoise species that might exist on the island, and Lonesome George is not alone. 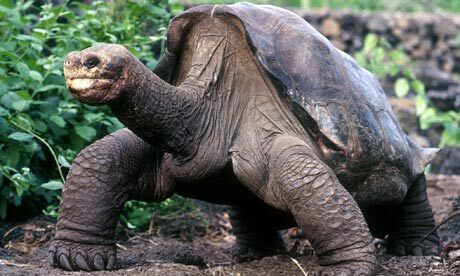 There is a lot of speculation and anticipation for Lonesome George because according to a feature by ‘World Environment News’, if he does not successfully produce an heir, the Pinta Island Tortoise species will officially become extinct. So we earnestly hope that George slowly and steadily wins this race!